← Checklists – Yes – Checklists! It was late in the evening and had already gotten dark and I was running low on fuel, so I decided to fill up instead of trying to make it all the way back into Austin on what was left. 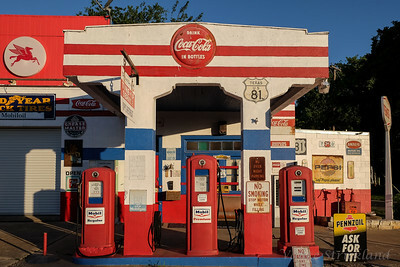 I exited southbound IH-35 at exit 275 in Jarrell, Tx and almost immediately saw an unlit little station – hmmm – that one’s closed. Then I noticed the signage – WHOA! – that’s cool! I made a quick mental note as to the exit number and once I was filling up at the “real” gas station I wrote down the info. so I could come back and photograph it in the daytime. It faces east, so it would need morning light (ugh!! sunrise shoot), not evening light. So last week I dutifully set my alarm for 5:30am (Double UGH!) and hit the road from Austin heading north to exit 275. You know – IH-35 north isn’t bad at 6 in the morning! I’m not a landscape shooter by any stretch of the imagination, so I was winging it. I did know enough to take a tripod, and the Fuji X-T1 has a built-in level so I could level out the camera. Just took the “kit” lens – the Fujinon XF 18-55 f/2.8-4, my XF 14mm, and the XF 55-200. Didn’t need fast lenses as I knew I’d be shooting at around f/11, not wide-open. Anyway… got there right around sunrise, found a place to park and setup my camera and tripod to get the wide shots first as I didn’t know how long the warmth of sunrise would last. 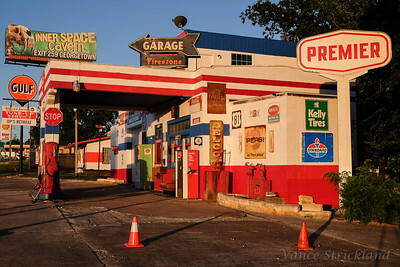 Worked out fine, turned out that I needed to let the sun come up a bit so that it peeked over IH-35 and fully illuminated the gas pumps – otherwise the shadow of IH-35 was covering part of the building. You can see in the opening shot that the frontage road in front of the station is dark compared to the station itself – using IH-35 as a gobo – but it didn’t last too long (minutes) so I lucked out. * turn off IS on my lens as the camera was on a tripod – I don’t know if Fuji IS is smart enough to recognize it’s on a tripod and deactivate. * set the camera to shoot RAW + JPG – just in case I wanted to really dig into a particularly cool shot. * be aware of my composition enough to notice when passing 18-wheelers cast a shadow on the scene so I’d need to take a second shot. Anyway – it was a “good stop” and quite a bit of fun. I have a better understanding of why “those landscape guys” go to all the effort to get out there before sunrise to catch a moment. Kudos to them! 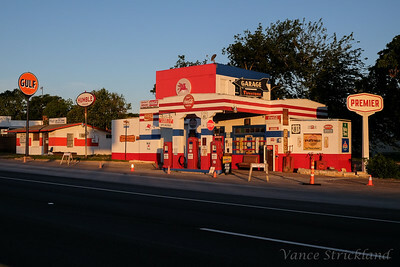 Any more cool and relatively unknown gas stations? If you want to share, leave a comment. 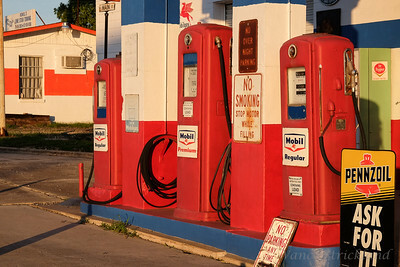 This entry was posted in photoop and tagged classic, gas station, Jarrell, photography, Tx. Bookmark the permalink. Great shots. Shoot raw then you can fix white balance on post. Raw would solve many of your issues. Yes, that’s true. I did actually shoot in Raw + JPG on this one. The gallery is all JPGs with a bit of clarity added in Lightroom. Will probably play some more with the Raw later.